Something different today: a collage of flowers from our garden. 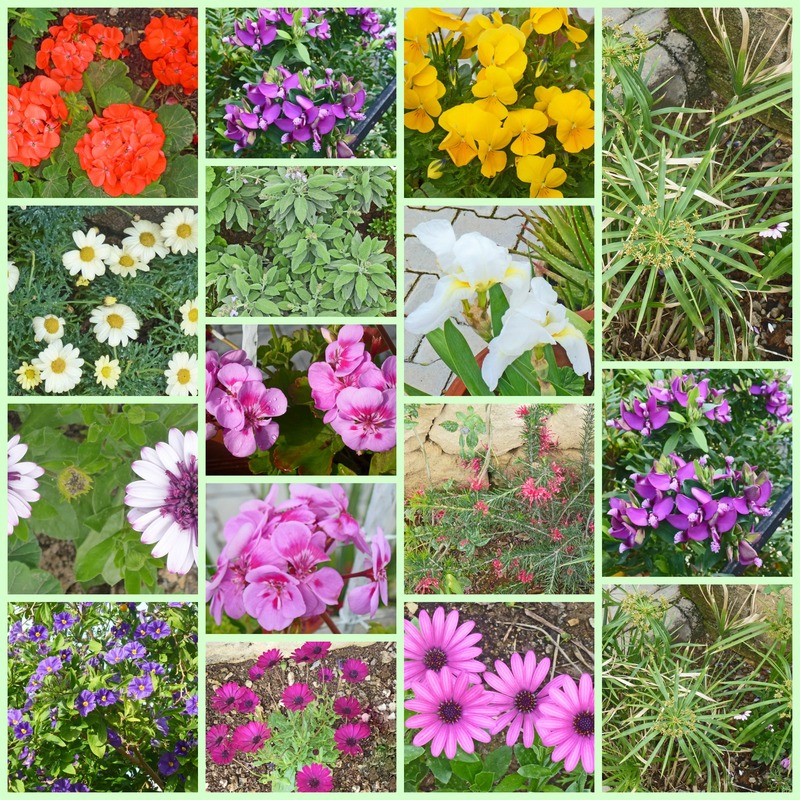 Although it’s a bit nippy by Cyprus standards, flowers are blooming nicely and my husband’s been busy in our garden, it’s looking really colourful now. Our only problem is that all the garden beds have to be fenced off to stop our four young dogs eating the plants. Somehow they managed to get under the netting today to dig two big holes so the two that committed this heinous crime are now in disgrace. Although they don’t seem to realise it – they still look remarkably cheerful and are wagging their tails mightily! I am so jealous!! We are another month or two off from spring flowers. Thank you for sharing this bit of sunshine today. I can see the faces of those 2 miscreants! Not a bit of guilty conscious in either, I’m guessing and when turned out again would do it all over without a moment’s hesitation. Well, actually, Mary, while Bryan was filling in the first hole, they were busy digging the second one! I heard the roar of outrage in my study and the two dogs, Molly and Zoe, came running into my room looking very cheerful and pleased with themselves! Uh,oh! May be a sign of more to come! But you just gotta love em! They’re so cute when they’re bad! Oh, no, not more holes! Thanks, Amy, I had great fun taking photos of all the flowers – they seem to have turned up all of a sudden. It certainly cheers you up after the winter. You have an amazing choice of flowers in your garden already now Mo. They are really beautiful. So many different ones! My one daff that tried to bloom was shrivelled by a frost. I’m trying really, really hard to be patient. Luckily for me, Ann, my husband is the gardener, otherwise we’d just have an arid patch if I were in charge. Happy to cheer you up, Cher! For ages I advised my husband to fence in the garden beds but he refused, just being stubborn. Finally he agreed and voila! no more flowers eaten. Hi! Coincidentally, today is Plant a Flower Day! I wrote about my favorite ‘flower’ picture book, Miss Rumphius, on my blog this morning. I’m sure you would love this story. It’s based on the real life of Alice Rumphius, the Lupine Lady of Maine. Hi, Juliana – Thanks for your comment, really enjoyed readng about Miss Rumphius ad the realife Alica Rumphius, fascinating. Hi, The Crazy Crone ,I liked your fabulous flowers and thanks for your sharing . Hi, glad you enjoyed the flowers. I’m going to hunt through my photos and do a spread on all the gardens we’ve had as my husband really does have wonderful green fingers. The collage of flower photos is lovely! It will be a long time before I have similar displays in England. Thank you for making my day!-Karen.